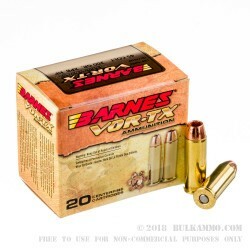 This .45 Colt load from Barnes is an excellent option for Colt Single Action Army or Taurus Judge owners looking to take advantage of 21st century developments in hollow point bullet design. 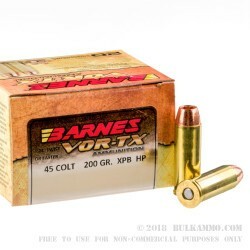 The Barnes XPB bullet, unlike most on the market, contains no lead. Instead, it uses a solid copper design that penetrates deeper and expands dramatically in its target. This amazing performance does come at an increased cost due to the price of raw copper. As a result, Barnes JHPs are best suited for applications such as hunting or home defense that take full advantage the proven lethality of the design. 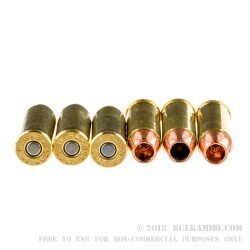 These cartridges use a 200 grain .45 Colt bullet and achieve muzzle velocities of approximately 1025 feet per second. 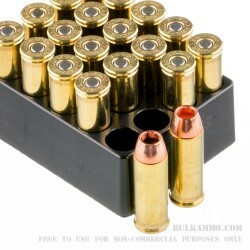 Each box holds 20 rounds in Boxer-primed reloadable brass cases. In business since 1939, Barnes has a long history of introducing disruptive technologies to the ammunition market. Fred Barnes' first design was a hunting bullet that used copper tubing instead of gilding metal as its jacket. The Barnes Bullet was one of the first custom bullets available in the US. After several ownership changes, the company came into the hands of Randy and Coni Brooks in 1974. The new owners worked directly with Fred Barnes to restore the Barnes brand and introduced the company's first all-copper bullet in 1979.